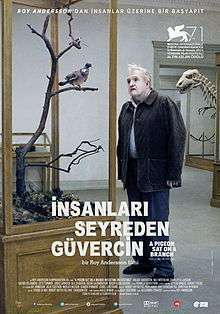 A Pigeon Sat on a Branch Reflecting on Existence (Swedish: En duva satt på en gren och funderade på tillvaron) is a 2014 Swedish black comedy-drama film written and directed by Roy Andersson. It is the third installment in his "Living" trilogy, following Songs from the Second Floor (2000) and You, the Living (2007). It premiered at the 71st Venice International Film Festival where it was awarded the Golden Lion for Best Film. It was selected as the Swedish entry for the Best Foreign Language Film at the 88th Academy Awards but it was not nominated. Its title is a reference to the 1565 painting The Hunters in the Snow by Pieter Bruegel the Elder. The painting depicts a rural wintertime scene, with some birds perched on tree branches. Andersson said he imagined that the birds in the scene are watching the people below and wonder what they are doing. He explained the title of the film as a "different way of saying 'what are we actually doing', that's what the movie is about." At the Venice Film Festival, Andersson said that the film had been inspired by the 1948 Italian film Bicycle Thieves by Vittorio De Sica. The movie consists of a series of mostly self-contained tableaux, sometimes connected by recurring themes or characters. The story loosely follows two traveling novelty salesmen, Jonathan and Sam, who live in a desolate flophouse, and their unsuccessful attempts to win customers for their joke articles (vampire teeth, laughing bags and a monster mask). Although there is no main storyline in the traditional sense, all scenes are connected. A Pigeon Sat on a Branch Reflecting on Existence received a 89% "Certified Fresh" rating on Rotten Tomatoes, based on 87 reviews, with an average rating of 7.8/10. The consensus reads: "Expertly assembled and indelibly original, A Pigeon Sat on a Branch concludes writer-director Roy Andersson's Living trilogy in style." The film also received a score of 81 out of 100 on Metacritic, based on 23 reviews, indicating "universal acclaim". The film also won the Golden Lion award at the Venice International Film Festival. ↑ "International competition of feature films". Venice. Retrieved 24 July 2014. ↑ "Venice Film Festival Lineup Announced". Deadline. Retrieved 24 July 2014. ↑ "Roy Andersson film scoops Venice Golden Lion award". BBC News. 7 September 2014. Retrieved 7 September 2014. ↑ "Sweden Sends Roy Andersson's 'Pigeon' to Foreign-Language Oscar Race". Variety. 1 September 2015. Retrieved 1 September 2015. ↑ Roxborough, Scott (1 September 2015). "Oscars: Sweden Picks 'A Pigeon Sat on a Branch' for Foreign Language Category". The Hollywood Reporter. Retrieved 1 September 2015. ↑ "Roy Andersson siktar på Guldpalmen". Svenska Dagbladet (in Swedish). 27 January 2013. Det är egentligen bara en slags omskrivning för 'vad håller vi på med egentligen', det är det som filmen handlar om. ↑ "Roy Andersson film scoops Venice Golden Lion award". BBC News. Retrieved 7 September 2014. ↑ "A Pigeon Sat on a Branch Reflecting on Existence review – a unique hallucinatory trilogy". The Guardian. 23 April 2015. ↑ "A Pigeon Sat on a Branch Reflecting on Existence". rottentomatoes.com. June 3, 2015. Accessed October 3, 2015. ↑ "A Pigeon Sat on a Branch Reflecting on Existence". Metacritic. Accessed October 3, 2015.